Learn the beautiful art of Tabla-playing in small group classes, not exceeding 5 students. Admission is open throughout the year to all ages and levels, and individual attention is given to each student. Students will learn basic-to-advanced techniques and compositions, as well as essential information to put them into the context of history and theory of Indian Classical Music. Beginners: Thursday 6 pm - 6.50 pm; Sunday 11 am - 11:50 am. Learn the beautiful art of playing Tabla with Samir Chatterjee. This is a class one-on-one private lesson scheduled according to mutual convenience. Techniques, intonation, simple to advanced compositions in various talas (rhythm cycles) and layas (tempo) are taught together with essential information related to the subject. 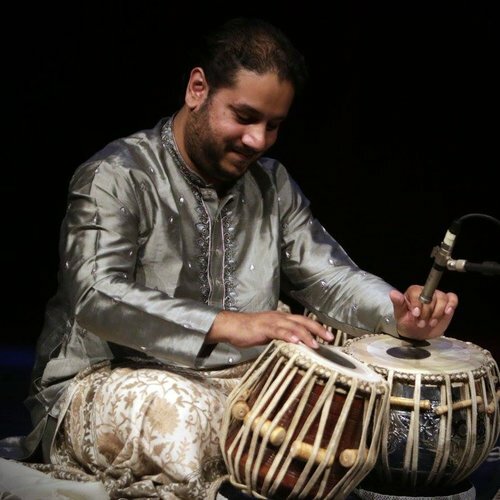 Learn the beautiful art of playing Tabla with Dibyarka Chatterjee. This is a class one-on-one private lesson scheduled according to mutual convenience. Techniques, intonation, simple to advanced compositions in various talas (rhythm cycles) and layas (tempo) are taught together with essential information related to the subject. Learn the beautiful art of Indian singing with Sanghamitra Chatterjee in one-on-one private lessons. Lessons are scheduled during the weekend according to mutual convenience. Lessons include voice training and exercises, basic knowledge of classical elements of Raga and Tala in Indian songs of different types such as bhajan, kirtan, geet, selective film songs, ghazal, regional songs, Tagore songs (Rabindra Sangeet), Nazrulgeeti, Atulprader gaan, folk songs, modern songs, etc. Admission is open to all ages and there is no pre-requisite. Instrument (harmonium and tanpura) are be available at the center. Learn the beautiful art of Hindustani (North Indian Classical) Music. These small size group classes and individual attention is provided in a group setting. Classes are open to all and there are no pre-requisites. Instrument (harmonium and tanpura etc.) are available at the center. You will learn subtle nuances of Indian Classical singing while maintaining a balance between ancient and modern approaches. Classes are held in three levels, beginners, intermediate and advanced and the level is determined by the Guru at the time of registration. Learn the beautiful art of Hindustani (North Indian Classical) Music with Samarth Nagarkar. This is a private one-on-one class. There are no pre-requisites. You will learn subtle nuances of Indian Classical singing while maintaining a balance between ancient and modern approaches. The level of the student is determined by the Guru at the time of registration. Learn the beautiful art of Hindustani (North Indian Classical) Music with Sanjoy Banerjee. This is a private one-on-one class. There are no pre-requisites. Learn the beautiful art of Bansuri Flute. These small size group classes and individual attention is provided in a group setting. Classes are open to all and there are no pre-requisites. Instrument (harmonium and tanpura etc.) are available at the center. You will learn subtle nuances of Indian Bansuri under a traditional approach. while maintaining a balance between ancient and modern approaches. The level of the student is determined by the Guru at the time of registration. Learn the beautiful art of Bansuri Flute with Steve Gorn. This is a private one-on-one class. There are no pre-requisites. You will learn subtle nuances of Indian Bansuri under a traditional approach. The level of the student is determined by the Guru at the time of registration. Learn the beautiful art of Bansuri Flute with Jay Gandhi. This is a private one-on-one class. There are no pre-requisites. Learn the beautiful art of Sitar with Abhik Mukherjee. This is a private one-on-one class. There are no pre-requisites. You will learn subtle nuances of Sitar under a traditional approach. The level of the student is determined by the Guru at the time of registration. Lessons are offered on Fridays, afternoon through the evening. Learn the beautiful art of Carnatic Violin with Arun Ramamurthy. This is a private one-on-one class. There are no pre-requisites. You will learn subtle nuances of Carnatic Violin under a traditional approach. Lessons are offered based on the merit of the student. The level of the student is determined by the Guru at the time of registration. Learn the beautiful art of Harmonium. This is a private one-on-one class. There are no pre-requisites. You will learn basic to advanced technique and compositions based on ragas and talas. These instructions are useful in accompanying oneself while singing bhajan, kirtans, ghazals, film songs and other types of singing. The level of the student is determined by the Guru at the time of registration. Learn the beautiful art of Bharathnatyam with Malini Srinivasan. This is a one on one class. Learn the beautiful art of Kathak. These small size group classes and individual attention is provided in a group setting. You will learn the north Indian classical dance form originated from the art of story telling. In additon to expression this dance form is also known for rhythmic footwork.